The minute I heard about Snap Power night light outlet covers (with the LED lights built into the cover itself), I knew I had to have some. I bought 5 of them! When they arrived, I experimented by putting them in lots of different places throughout the house. That’s when I learned just how easy they are to install — all it takes is a screwdriver! You simply unscrew your current outlet cover from the wall, and then you screw in the Snap Power night light outlet cover instead. That’s it. Seriously. I installed all 5 myself in just minutes. 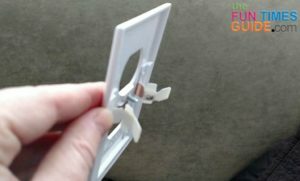 Here’s a great write-up if you want to follow along as Julie installs Snap Power Guidelights in her home. 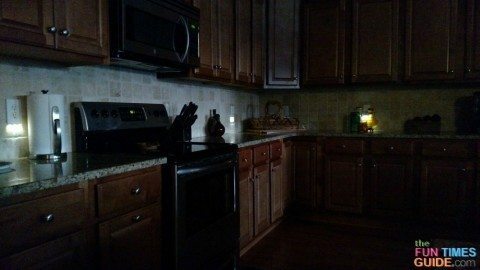 Initially, I had planned to only put one of the night light outlet covers in the farthest corner of the kitchen — where it’s extremely dark. But after putting one there, things felt uncentered in the room. So I ended up putting 2 more in the kitchen to balance out the “glow” above the kitchen countertops at night. It looks much better than just having one there. Of the 5 that I purchased, I now had 2 left to put somewhere. I ended up putting 1 in our master bathroom and 1 in our powder room. #1 – Don’t do like I did and just assume that all of your outlets are standard. 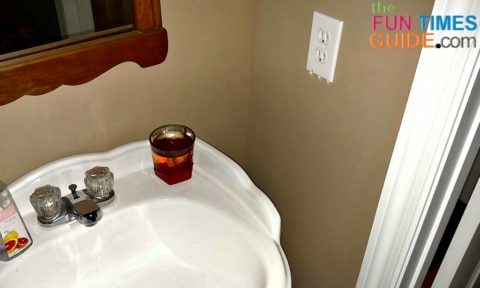 Any outlets located near sinks will most likely be GFCI outlets — with reset buttons. Snap Power doesn’t make GFCI outlet covers with night lights at this time. Unfortunately, the outlet that I wanted a night light outlet cover for the most (the one in our large master bathroom, near the sink) is a GFCI outlet. So that was a bummer. The second place I was eager to put the Snap Power night light was in the garage — near the walk-thru door to light the way for our pet sitter when she comes at night. However, there’s only a round 3-prong outlet there for our central vacuum (that we don’t use), and Snap Power doesn’t make outlet covers with Guidelights to fit that style of outlet either. I ended up putting one of these in the garage instead: Mr Beams Motion-Sensor Light. It works great! #2 – In very dark corners, the light will stay on all the time. That is, unless you turn on an overhead light or have enough natural light that reaches the outlet cover. They say it only costs 10 cents a year to operate one of these night light outlet covers. And the lights themselves will last 25 years. But I’m guessing those figures are based on the fact that the lights are not glowing for at least half the day. So, even though it won’t cost much if the lights happen to stay on, you might only get half the life (12+ years) out of the bulbs themselves if they’re glowing most of the time. In our case, pictured below is the Snap Power night light that tends to stay on most of the time — because the refrigerator is immediately to the right, and it prevents most of the room’s natural light from reaching this particular outlet. #3 – In some cases, it would look better if the lights were shining upwards, rather than downwards. Or it might be nice to have one pointing to the right, rather than to the left — or vice versa. However, the Snap Power outlets are constructed in such a way that the direction you put them is dictated by the direction of the ground prongs in your outlets. Good news #1: You could change the direction of your outlet’s electrical box, but you’d definitely have to turn of the electricity first. Then, you would simply reverse the direction that the outlets are wired — so the ground plug is closer to the top, rather than closer to the bottom of the outlet. 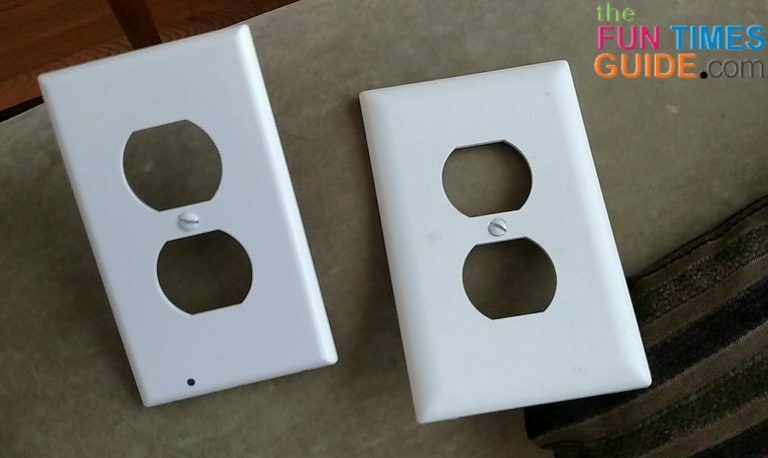 Good news#2: Depending on how crowded things are on the sides of your outlet boxes (you can tell after you take the outlet covers off), you might be able to get a good enough connection simply by changing the direction of the Snap Power outlet cover itself. In my house, it didn’t work for 2 of the outlets that I tried. But it did work that way for 1 of the outlets and I’ve kept it that way ever since. 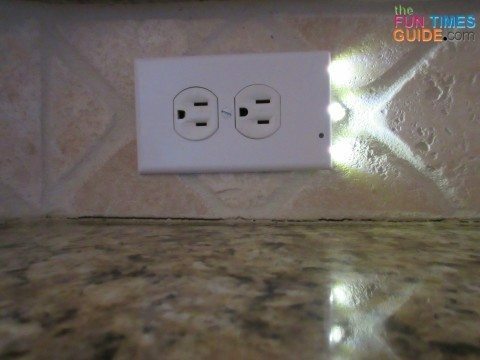 In my opinion, when the light is shining upwards on the Snap Power outlet cover, it’s a brighter light that reflects differently — and it covers a slightly larger area. The reason? 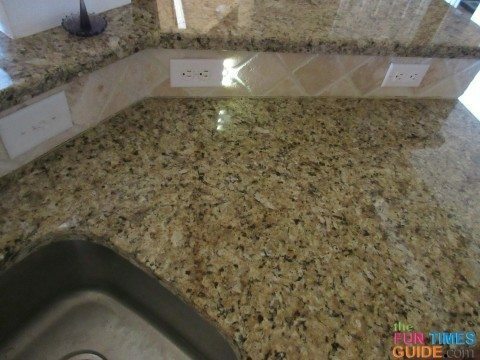 There are more surfaces for the light to bounce off of, as opposed to when the light is simply shining straight down onto the countertop or floor below it. In our case, (pictured above) I wanted the light to point in the direction that we walk into the kitchen, rather than having it point toward the kitchen sink. As you can see, we were using traditional auto sensor night lights in the 2 outlets in our master bathroom. For what it’s worth, I do like the power failure night lights because they have one unique “extra” feature. Not only do they automatically turn on at night and off in the morning, but they also have a flashlight beam that shines automatically when you unplug them from the wall! I have a few of these Sylvania power failure night lights. I put them where it would be most useful to have a flashlight handy. But we’ve become frustrated that the plugs in both master bathroom outlets are used up with night lights all the time! So we always have to unplug a night light before we can plug in Jim’s razor or my hair dryer — or whatever. With the Snap Power nightlight outlet covers, you don’t have to unplug anything! The night light shines from 3 LED bulbs on the bottom of the outlet cover itself. Overall, SnapPower Guidelights are the most energy-efficient night lights in the market.